Everytown is BUDS' flagship youth leadership-development program specifically designed to address and reduce prejudice and conflict, and to prepare youth to be leaders within a diverse community. Experienced facilitators guide young people through a series of transformative dialogues, culture-sharing activities, and interactive games. The week culminates in delegates developing action plans for building understanding upon return to their schools and home communities. Hear what past participants have to say. Contact us to discuss co-sponsorship opportunities. Make a financial DONATION to ensure no youth is turned away from participating and enriching 2013's Camp Everytown. Carefully assembled delegate cohorts break down divisive stereotypes. 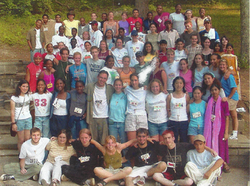 Each camp has a one-to-four ratio of trained adults to youth delegates. Everytown focuses on enhancing conflict-resolution skills, citizenship values, and interfaith and inter-cultural respect. Alumni are encouraged to return to Everytown as trained student counselors and are provided follow-up service leadership opportunities. Ongoing assessment, evaluation and reevaluation of curriculum are based on participant feedback.